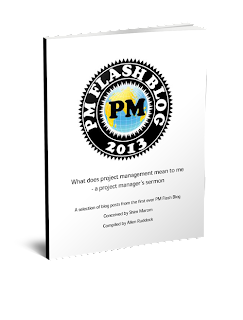 Musings on project management: Scheduling ... how did we get here? Patrick Weaver gave a talk at Primavera06 about the history of scheduling. His talk is captured in an interesting paper: "A brief history of scheduling: back to the future"
So, what is the history of scheduling? I certainly remember the days of yester-year before MSProject and its adult cousin Primavera; I remember when the only scheduling tool I had was graph paper, and I remember when the mainframe scheduling tools began to replace hand-drawn bar chart schedules and simple networks. The science of ‘scheduling’ as defined by Critical Path Analysis (CPA) celebrated its 50th Anniversary in 2007. In 1956/57 Kelly and Walker started developing the algorithms that became the ‘Activity-on-Arrow’ or ADM scheduling methodology for DuPont. PERT lagged CPM (Critical Path Analysis) by 6 to 12 months (although the term ‘critical path’ was invented by the PERT team). Later the Precedence (PDM) methodology was developed by Dr. John Fondahl; his seminal paper was published in 1961 describing PDM as a ‘non-computer’ alternative to CPM. Of course, one of the most profound developments was the arrival and market penetration of the low cost PC-based personal scheduling tools like MSProject. In Weaver's view that made schedulers out of everyone, but everyone is not a scheduler, or can even spell the word. In my personal opinion, the integration of Monte Carlo tools with low cost scheduling applications like MSProject was equally profound. The MC simulation "fixes" some of the most egregious problems with PERT and the simulation idea has largely run PERT into obsolescence. The main thing that PERT does not handle well is schedule joins or merge, and the statistical merge bias that goes with it. On the dark side, MSProject has profoundly muddled the whole idea of the WBS. The fact that one of the fields in MSP is called "WBS" is most unfortunate. There are a whole generation of project analysts who believe they created a WBS by the simple act of making that field visible. Not so: schedule is the "verbs" of the project; WBS is the "nouns". Together, WBS + schedule = project narrative.